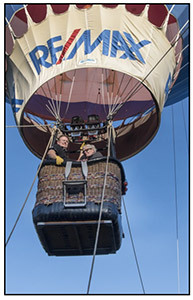 On October 22, 2016, as part of the Campaign for a new Marianna Black Library, area residents were able to participate in a hot air balloon fundraiser, sponsored by Re/Max Awensasa Realty, in Bryson City. This fundraiser was a huge success, with some folks coming to take flight and others just wanting to watch! Thanks to Chester and Karen Bartlett, of Re/Max Awenasa Realty, for making all the arrangements and a special thanks to Darnell Farms for hosting this wonderful event!